Yakuza by Fugaso is one of the simplest slot games in the studio’s collection that will charm you with its stunning design, straightforward features, and solid payouts. This medium variance slot is very easy to get to grips with on mobile, tablet or desktop and is part of the Fugaso Jackpot Series. Learn all about how you can win these extras by checking out our full guide to the game or try a free Yakuza slot game to test these features for yourself. This new slot game from Fugaso was inspired by the Yakuza crime syndicates in Japan, to which it pays tribute with traditional music and stylish thematic symbols like swords, mobsters, and lucky dragons. Play it at a real money online casino and you may be lucky enough to win payouts of up to 20,000x your line bet, on top of one of three progressive jackpot prizes that could be yours with the right dose of patience. Like any Fugaso slot, Yakuza was built to be played on any device, mobile and tablet included, for a chance to grab juicy amounts of cash on the go. With its base prizes alone, this slot already has more than enough to offer to its players, but add the free spins bonuses and expanding wilds on top, and it becomes even more attractive. The Yakuza slot is yet another simple slot game from Fugaso that can be played easily, even if you’ve never played slots before. There are only two bet controls on the screen you need to consider, one that determines your payline bet and one that selects the number of paylines you want to play. You can use these controls to choose a stake as low as 0.02 credits or as high as 100 credits and anywhere in between. If you are wondering which paylines to select, you can simply press the numbers you see on the sides of the screen and the slot will automatically highlight each payline for you. You can win money on these lines by collecting any of the 12 paying symbols, some of which also serve as special bonus symbols. The payouts are given as multipliers to your payline bet and they start at 10x your line bet for a three-of-a-kind win and go up to 5,000x for a single sequence. But what’s unusual is that you can double-up on any payout you win while playing for real cash by entering the gamble game that becomes available after every win. Yakuza can also be played on tablets and smartphones that use the iOS and Android operating systems, but in a downsized version. Rotate your device sideways to load the game and tap the screen to start playing on your phone. You’ll have manual and auto spin buttons on your right to control your spins while the bet controls can be accessed through the right corner menu at the bottom of the screen. Once the stylish icons of card suits and Yakuza weapons start rolling on the screen, it will be up to a sequence of three or more matching symbols to trigger your prizes by landing on an active payline in a left-to-right direction. The icons that give the best payouts in the Yakuza slot are actually the bonus icons and not the regular symbols. The Yakuza wild is particularly worth your attention as it can both substitute for every other symbol but the scatter and pay up to 1,000x your line bet while playing at a real money online casino. The scatter symbols are also quite valuable because they can pay prizes and trigger free spins bonus games. Land three, four, or five of these symbols on your reels and you can bank payouts of 40x, 400x, and 4,000x your payline bet, respectively, plus a bonus of 10 free spins. As an added plus, during the free spins bonus, you’ll also get to enjoy expanding wild symbols which grow to cover a full reel with wilds once they land on your screen. Just like in many other jackpot slots from Fugaso, this slot also comes with three different progressive prizes. The prizes are split into three tiers, Mini, Midi, and Maxi, each of which offers a bigger payout than the jackpot preceding it. All of the prizes grow incrementally as punters continue betting on the game and any of them can be won during any round, no matter if you’re betting small or spending a hundred credits per round. 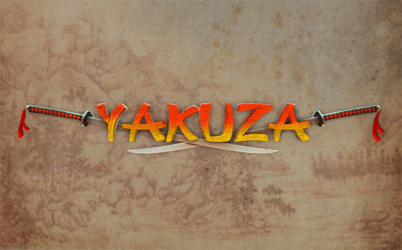 Yakuza is a slot game designed for traditional punters with a taste for straightforward but lucrative online slot games. Due to its medium volatility, this slot can end up producing payouts both small and big when playing with real cash, up to 20,000x your line bet. Even if you want to invest only a few cents per spin, you’ll still be able to enjoy this slot and the same goes for if you want to bet like a high-roller. However, if you’re expecting to see big prizes on your screen often, don’t, because with the high hit rate of Yakuza, such payouts will likely be an exception. If you’d rather play a slot game that can pay better, but with an increased dose of risk, there are a few great alternatives from Fugaso you can look into that offer high volatility gameplay. The Book of Tattoo is a great choice if you want a simple but volatile slot that gives you a shot at collecting prizes on six different reels of up to 7,500x your line bet per sequence. The Crazy Bot and The Mummy 2018 are also great options to explore if you want to have more bonuses at your disposal. Try these games at our listed Fugaso casinos and get to enjoy enticing bonus offers on top of some great slot entertainment.